Warmth of Summer arrives in June! At last warm June weather is upon us and the garden is blooming. Rhododendrons with their large pompom flowers purple, red and peach seem to jump out of the flower beds with a plethora of geranium dark blue, light blue, purple, white, and pink sprinkled at their feet . 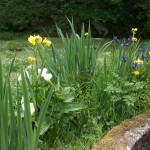 The pond in the woods is at its best as yellow, white and blue Iris mingle with Arum lillies. 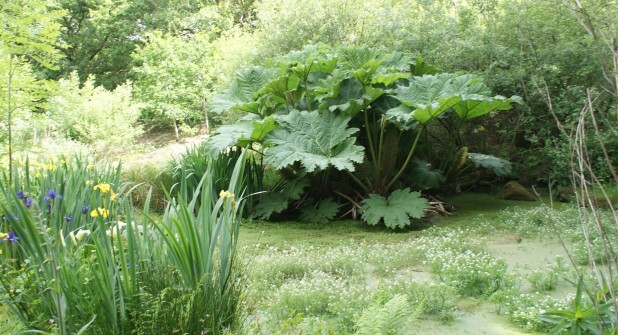 The Gunnera, with its gigantic leaves stands guard over the lily pads. Let’s hope we can at last look forward to a few weeks of warm Summer weather. We’ve had lots of blue sky days over the last month but the winds have been chilly. The Bluebells in our woods this year have been wonderful. When we came to Darrynane in 1998 the woods were home to a flock of Soay sheep who ate everything. We passed them on to a friend with a small holding in 1999 and it has taken this long for the woods to recover. Over Winter we’ve also been battling the brambles, with the help a local boy, Chris, who has been strimming each week. Hopefully this will allow the moss to return. 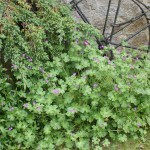 It has certainly helped the ferns. Their feathery leaves carpet the woodland floor. The Cornwall Show has been and gone – we visited on Saturday afternoon – bustling with excited people carrying their bags of freebies and bargains. We hunted for 18th birthday presents for friends. I feel it’s always best to go with a mission. As always we ended watching the hunt relay – North Cornwall came second. Recently we enjoyed a delicious Sunday lunch at Fifteen overlooking Watergate bay – a family treat for Ameisha’s 18th Birthday. The large restaurant windows peer over the beach – a wonderful setting. We all had something different, chicken, fish, pork , steak yet each agreed the food was succulent and different flavours bursting with every bite – a special day to remember. 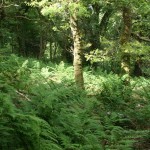 Cardinham Woods have become a popular destination for our ourselves and our guests. The many trails provide short, medium or long walks and you can make them as easy or difficult as you want. It is a must for those bikers too with easy to extreme trails available. The cafe is a treat to look forward to at the end of any kind of exertion! David and I and the dogs have been exploring the forestry commission site around Dunmere. Again there are many different trails that go on for miles offering short cuts back to the car if you’ve had enough. It’s quite easy walking although we haven’t explored the steep bits yet! Fishing the Camel river is now available from June – end September at £12.50 per day. 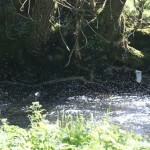 You will also need a valid fishing licence from the Post office. Contact us for details or ask when you arrive at Darrynane. 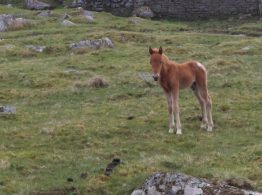 After a slower start this year the cottages are beginning to book up. We do have vacancies from 26th June, so if anyone wants a short break or longer holiday from 26th June we have some availability. Call or email for a price. We wish you a great few months of Summer and hope to see you sometime soon. Riverside cottage – May 2015!